The other day, while Josh and I were working on the big switcheroo, I had a meltdown. Like tears streaming down the face and backing myself into the corner of no-going-back and I'm-the-worst-wife-ever. It began with a basket, a joystick, and compromise. As part of the big switch to make room for baby, we decided to combine our bedroom and office. This meant that we sold a lot of Josh's (not so pretty) office furniture, reduced the extras, and started having shared desk space. We went from splitting half of a huge room to sharing a little corner office space in the bedroom. I told Josh I was A-okay with this move as long as the office part didn't look to "officey." He said he was okay with this move if I didn't become a desk hoarder or take away all of his space. Well, while he was busy unpacking his big bin of what-was-once-on-his-desk, I noticed that he kept piling things onto my (oops, our) desk. Cords. Hard drives. Techy stuff. 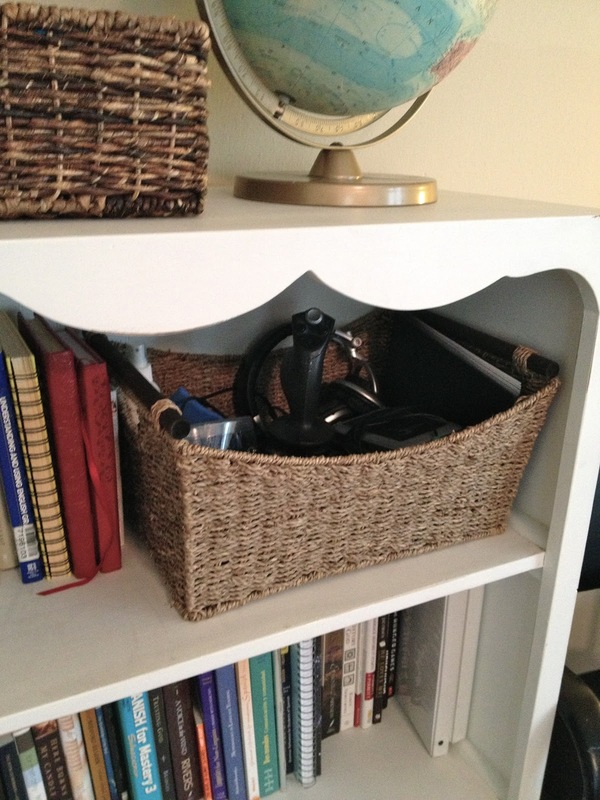 I had designated (see me there, controlling...) a basket for him to place all his office stuff into so that it could sit all pretty on the bookshelf. Really, I just wanted it away from plain sight. I didn't want to see any cords, wires, calculators, or engineer-worthy pencils while I was sipping my coffee in the morning. So, when I noticed him unpacking all this on the desk, I got a little worried. Why was he putting all that junk on my desk? He was happily unpacking--some items onto the desk, others in the basket--and totally unaware that I was ready to pounce. When I saw him put the joystick in the basket and noticed that I could see the joystick poking out, I lost it. I hit that I-am-overwhelmed-and-this-is-not-going-how-I-thought-it-would-go moment. I did not want this room to look like an office. Stop putting all that junk on the desk. Can't you move the joystick? Argh! I can see it! That's so annoying. Everything is the basket is supposed to be hidden! I don't want hard drives on my desk--they are soooo ugly! We don't use them regularly so why put them on the desk? At this point, I was literally throwing words at him, melting down like I was 3, and shaking my head. He retorted (as he should) because I was trying to walk all over him with my way, my ideas, and my expectations. It escalated--he was frustrated that I was being so demanding and not giving him any space. And me, well, I was upset that he wasn't doing things my way. I was, literally, seething mad because I could see his joystick sticking out above the rim of the basket. Josh eventually walked out, told me to put away his stuff, and left me standing there was piles of electronics all around. Honestly, that didn't rub me the right way, but by this time, I was realizing how ridiculously selfish, controlling, and over-the-top I was being. We both took some time to cool off. It didn't take long for me to regret what I had done--to regret speaking to my husband in that way and demanding my way or the highway. It is in these moment that I feel His Spirit (strongly!). Convicting. Pouring grace. Asking me to humble myself and ask for forgiveness. Of course, Josh and I came to the middle of the battlefield, shared, made peace, and became allies again. Now, that joystick sits in its basket and I decided (happily) to leave it there--top poking out and all. It reminds me that even though I can be so stubborn and selfish, I have a husband who forgives me and a God who extends grace. And both love me despite meltdowns over electronic devices! Have you had any moments where grace, forgiveness, and love stared you in the face--despite all that you've done? I am due March 25th and very much feel like I am in the same boat. I melted down over one picture being slightly off in an entire gallery wall of art (finally) hung. The nesting + need to be perfect sentiments are so overwhelming at this stage of pregnancy!